A new recommendation by Warings Furniture to save the future of service table tops. A new surface cleaning spray for the Hospitality Industry is to make the relaying of tables quick and efficient. Operators in the hospitality industry can expect clean table tops while ensuring that their furniture is unharmed by harsh chemicals. 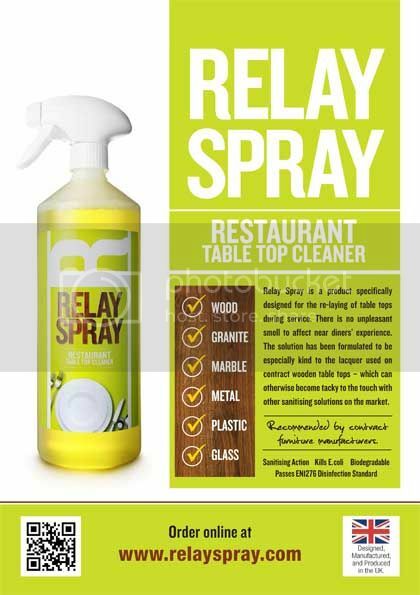 Specially formulated to be gentle on the lacquer used on contract wooden table tops, Relay Spray does not cause tables to become tacky to the touch when sanitised like other disinfectants on the market, ensuring your hospitality furniture remains in tip-top condition.